A colleague recently reminded me that there are ultimately two things we can do with money: spend it or give it away. That’s it. At first glance, this seems too simplistic. What about saving? What about investing for our future security? What about creating wealth? Even when we are in the process of accumulating money and building wealth, we do so for the inevitable day we choose to spend it or give it away. Investing for retirement is about providing money to spend when we’re no longer earning an income. And whatever we have left at the end of life is ultimately given away. Furthermore, the decision to spend or give away money is always a choice, even when it may seem we have no choice. Here is why. Most money experts break spending into “discretionary” and “non-discretionary” categories. Another way to frame this is “wants” and “needs.” Discretionary spending includes items that we want which aren’t necessary for survival, such as entertainment, vacations, designer clothes, and gourmet food. Non-discretionary items, or needs, include basic housing, food, clothing, and transportation. Discretionary spending is clearly a choice. Yet even though we may tell ourselves we have “no choice” but to spend money on non-discretionary needs, fundamentally we always have a choice. We may think we make the mortgage or rent payment because we “have” to, but actually it’s a choice because the alternative is to find a new place to live or be homeless. We make the car payment because we choose not to walk or use public transportation. We may choose to work at a job we dislike because it allows us to spend money on other choices we deem more important than job satisfaction. We choose to pay our taxes in order to avoid serious consequences like heavy fines or even going to jail. We choose to earn and spend our funds in the ways we do, not because we “have to,” but because there is a payoff that makes the choice worthwhile. Yet in every case, it’s still a choice. Even when we give because it seems to be the only way to avoid detrimental or catastrophic consequences, we’re still making a choice. In some cases, choosing not to give (to a child, for example) may result in some wonderfully rich life lessons or behavioral changes. The one time it seems that we really have no choice on whether we spend or give away our money is when we die. But even then, the choices about giving what we have left are made during our lifetime. Those who don’t do estate planning are choosing to let others decide how their money will be given away, with those decisions constrained by the provisions of their state’s laws. The bottom line is that when it comes to spending or giving money, we always have a choice. Ultimately, all of the money we choose not to spend while we are alive is money we are choosing to give away after death. 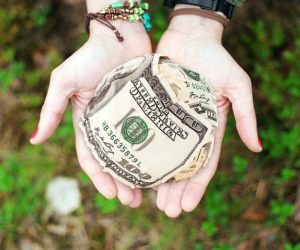 When we view our spending and giving as a matter of choice, it may be easier to see the importance of making money choices thoughtfully and consciously. The way we use our financial resources is crucial both for supporting our own life aspirations and for giving back to our families and communities. Choosing to spend consciously and give wisely is one more way we can choose to live richer, more fulfilling lives. Save for Retirement, or Hope for Mystical Resolution?